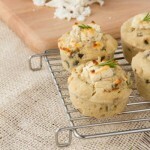 Preheat oven to 400F and line a 6-cup muffin tin with muffin papers, or oil well with olive oil. Set aside. Add olive oil, onions and garlic to a small saucepan. Sauté on high heat for 5 minutes, until golden. Set aside. Meanwhile, whisk together milk, egg and yogurt in a large bowl. Then, combine flour, baking powder, salt and pepper in a small bowl and mix with a fork to combine. Add dry mixture to wet and stir with a fork until just combined. Fold in cooked onion mixture and savory. 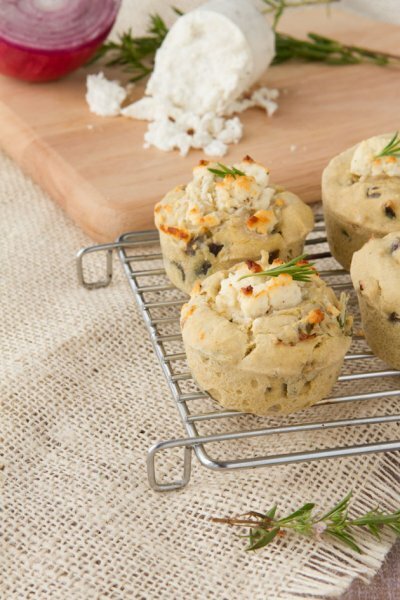 Divide batter into prepared muffin tips, press 1 teaspoon of cheese in the middle of each muffin, and bake for 20-22 minutes, or until toothpick inserted comes out clean.